Hillsborough Soccer Stadium Disaster: British Jury Blames Police For 96 Deaths : The Two-Way The findings contradict what had stood as the official explanation: that Liverpool fans died in the 1989 incident because of an accident that was worsened by their own behavior. 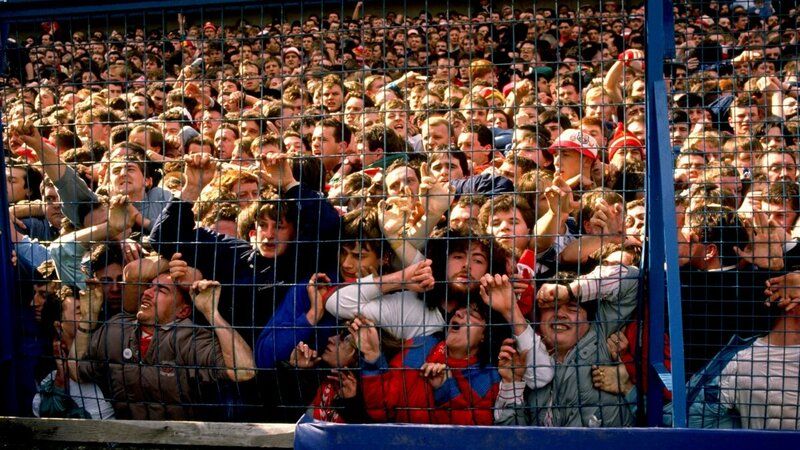 Liverpool supporters were crushed against a barrier in 1989, in what became Britian's worst sports disaster. Some 96 fans died in the incident at the Hillsborough Stadium in Sheffield, England. A 27-year quest for vindication ended in triumph Tuesday for the families of 96 people who were killed in the Hillsborough Stadium disaster in 1989. A jury says Liverpool fans weren't to blame for the worst sports disaster in Britain's history — the police and other factors were. The jury's announcement released a flood of emotion in and around the courtroom, with family members of the dead weeping and shouting in celebration. Some held Liverpool's red scarves with the word "Justice" on them; several dozen people gathered outside the courthouse to sing the club's anthem: "You'll Never Walk Alone." Responding to the verdict, British Prime Minister David Cameron said via Twitter, "I would like to pay tribute to the extraordinary courage of #Hillsborough campaigners in their long search for the truth." The jury's finding promises to alter forever the public's perception of that day in which fans were crushed to death inside the stadium. While images of people scaling a fence to reach the playing field might once have been seen as proof of unruly behavior, those pictures now serve to show the desperation of people who sensed a deadly tragedy unfolding around them — and tried to escape it. In addition to the 96 people killed, 766 others were injured. "Are you satisfied, so that you are sure, that the 96 victims were unlawfully killed? YES"
"Did the supporters' behavior contribute to the dangerous situation at the turnstile? 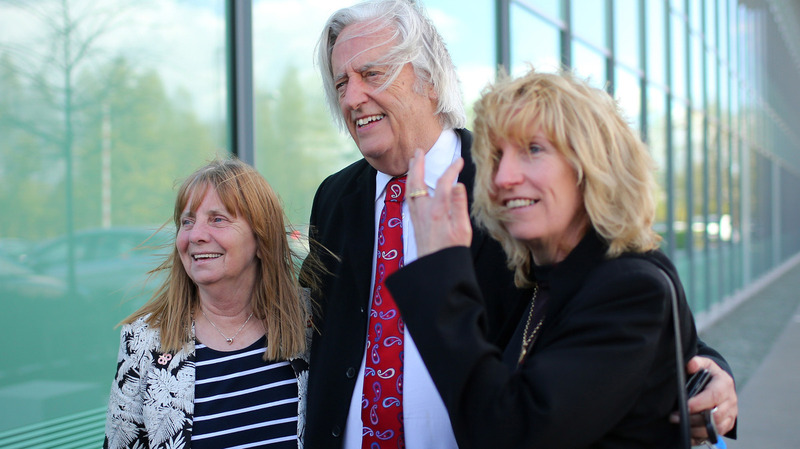 NO"
(From left) Margaret Aspinall of the Hillsborough Family Support Group, attorney Michael Mansfield and and Sue Roberts smile outside the courthouse after hearing the conclusions of the Hillsborough inquest Tuesday. Those findings contradict what had been the official explanation for the Hillsborough disaster: that it was an accident exacerbated by fans' behavior. That version of events was backed by an initial inquiry in 1991. The alternative — and as of today, broadly accepted — account took decades to emerge. It faults delays and communication failures by the police, along with the stadium's design flaws and lack of a safety certificate at the time of the match. This new account also accuses officials of manufacturing a cover-up by suppressing evidence that ran counter to the approved narrative. Much of that evidence, from video footage to witness testimony, was at the heart of the recently concluded inquest. The jury's findings were announced two years after the inquiry first began. Back in 1989, the disaster unfolded as Liverpool and Nottingham Forest met in the semifinal of the Football Association Cup's tournament, in a match held on neutral ground in Sheffield, England. Fans packed terraces and other parts of the stadium, and when police opened gates in one area, fans who were expecting to find open space were instead jammed into an already overcrowded terrace, as a BBC in-depth report found in 2013. Many of those who died that day are believed to have essentially suffocated while standing up, unable to breathe or move. Some who escaped did so by being hoisted over fences and onto upper tiers by other fans. In addition to the 96 who died, 766 people were injured. Only a fraction of those who died ever reached a hospital that day. Two of those who died were teenage sisters Victoria and Sarah Hicks; their father, Trevor Hicks, is now the president of the Hillsborough Family Support Group. Speaking to Britain's ITV about that day in 1989, Hicks says he wasn't surprised when his daughters ran off while he was getting a coffee at the stadium — but that the next time he saw them, they were in severe distress. Neither girl survived. "I always used to joke and say I will have two weddings to pay for," Hicks tells ITV. "I'd be delighted to have had that problem." As for Tuesday's finding, he says that while his girls would "probably think I'm a bit of a silly old fool," he'd like to think they would be proud of the inquest's outcome. A caption in a previous version of this post identified one of the women with attorney Michael Mansfield as Yvette Greenway. She is Sue Roberts.